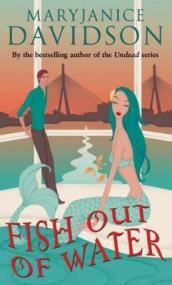 I’ve always been more of a fan of Mary Janice Davidson’s vampire series, but I loved Fish out of Water regardless. I read the entire damn thing in one sitting. Granted, it’s not a long book and it’s hardly difficult literature, but I thoroughly enjoyed it. Even got the Happy Book Fuzz at the end. Fred the Mermaid has taken the bait and chosen to date Artur, Prince of the Black Sea, over human marine biologist Thomas. And just in time. The existence of the Undersea Folk is no longer a secret, and someone needs to keep them from floundering in the media spotlight. Fred has all the right skills for that job, but has a hard time when her real father surfaces and tries to overthrow Artur’s regime. I did enjoy the other two Fred books (Sleeping with the Fishes and Swimming Without a Net) but I vaguely remember not thinking that much of them. I mean, they were alright, but nothing compared to Betsy and her vampire consort. I picked up this one at 11pm last night because I wanted something light to read in bed after the depression and misery that was The Postmistress (review here). It’s been languishing on my TBR for more than a year now, but I was never that way inclined. Shows what I know, because then I laid in bed and read the entire thing until the stupidly early hours of the morning. For those who are new to Mary Janice Davidson’s books… you’re missing out. Her first series begins with Undead and Unwed – it’s about a young, blonde, vain woman who, shockingly, gets turned into a vampire. I know, I’m allergic to vampire books now too, but these came out before the trend and they’re actually good. It’s vampire chick-lit, I suppose. I think I liked this book more because it has a better plot than the others. There’s a love triangle present between Fred, the Prince of the Undersea Folk and Thomas, an ex-colleague. The previous two books focused more on the romance aspects; Fish out of Water still has that triangle but it’s more of a sub-plot. Instead, the real point is to foil the coup that is forming to overthrow the underwater government. The ‘twist’ is a little predictable, but so what? I just love the characters in this. They’re snide, bitter and make catty remarks… all the things I admire in a person. I especially liked the banter between Fred and Jonas as you can really see the years of friendship and loyalty between them. I was less impressed with the lack of chemistry between Fred and Artur, but I think that was due to the formal way he speaks. I’m not sure why, but reading light, fluffy books when you’re fed up always makes you feel better. I was in a horrible mood last night, but after reading this I went to bed with a smile on my face. Who doesn’t like sarcastic mermaids and fluffy endings? I LOVE the Undead series by her, but I've not read the Fred series. Mostly because, as you said, there's reviews out there that have said Betsy and Fred are almost identical. After reading your review though, I'm going to definitely have to pick these up and give them a read! I didn't know this serie, but I've read the Betsy serie, that I really love. Maybe I will try this one too ! Thanks for the review !